[tweetmeme] We all love these facts: If mobile phones chargers were left plugged in and switched on they would consume enough electricity to power 66,000 homes for a year. It sounds good. It sounds like you could make a difference by switching chargers off. But if this were the solution to a sustainable planet, it’d be law – much like the speed limit, or murder. It isn’t. So why isn’t it the law to switch off mobile phone chargers? Let’s do the maths: 66,000 homes is just one quarter of one percent of the 25 million homes in the UK. So switching chargers off would save one quarter of one percent of all household electricity consumption. If everyone makes one quarter of one percent difference, then we’ve made a combined difference of one quarter of one percent . There’s no avoiding it. The tricksy bit is when we reconfigure the one quarter of one percent into a number (ohh, big!) or re-imagine that a small section of society had made a 100% change (ohh, free pass). But it doesn’t matter how you pile up your chips – you don’t have any more than you have (I know, what an elegant phrase?!?). The problem is the huge amounts of energy we consume. Or, more to the point, the problem is that we are simply unaware of the huge amounts of energy we consume. Here’s some more brain-scrambling things that make you realize just how much energy we consume, and where our efforts should really be. 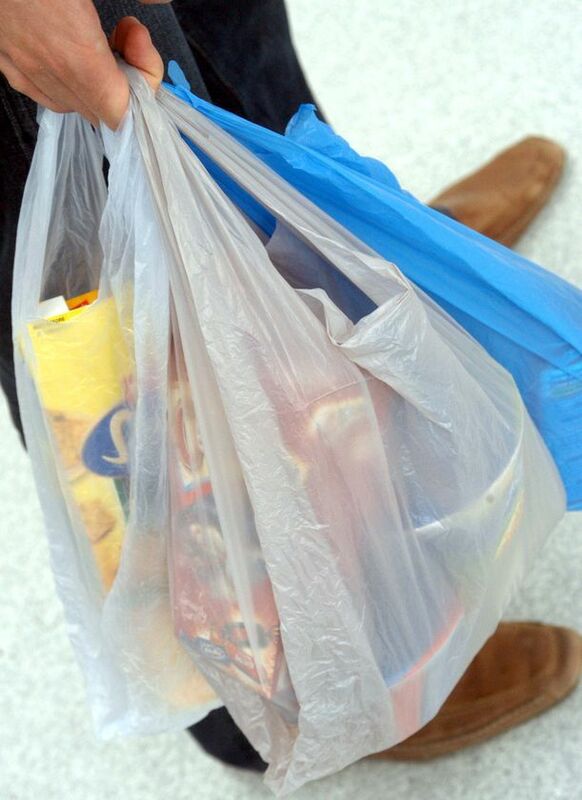 The total energy burden to make your yearly supply of plastic bags (before you started using your ‘bag for life’. You do have a ‘bag for life’ don’t you?) can be offset by driving only 15 miles less per year. The aviation industry is trialing a new GPS system that effectively gives pilots a 3D version of a TomTom Sat Nav. It replaces the existing WWII Radar technology that – although safe – prescribes flight directions in zig-zag patterns and height instruction in crude steps. Amongst other savings it’s these descent ‘steps’ that can be replaced by a gentle glide – allowing the use of minimal throttle. These CDAs (Continuous Descent Approaches) are being trialed at the UPS main hub in Louisville, Kentucky and are reckoned to save 40-70 gallons per landing. Are we back in the land of the one quarter of one percent again? UPS delivery vans don’t make left turns anymore – not if they can help it. According to UPS spokesman Dan McMackin a new route planning technology eliminated all right turns for their delivery vehicles. In the US right turns involve crossing on-coming traffic, which causes delays and stop-start driving. Simply removing this turn and replacing it with left turns (three left runs and you’ve effectively made one right turn) has trimmed 464,000 miles from UPS’ cumulative delivery mileage, saving more than 51,000 gallons in fuel, and reduced carbon dioxide emissions by 506 metric tons over an 18-month period. They know that two wrongs don’t make a right, but three rights make a left. It’s vital that we focus on actions that make a significant difference, and put those actions that make very little difference at the end of the list. Seriously now, if your friend came to help you move house and you found him holding a thimble full of rice and proclaiming himself ready to ‘drop off the first container at your new place’ your first thought wouldn’t be ‘every little bit helps’. You know how much stuff needs to be moved, so you can put the thimble of rice into context. We all need context. Sustainable Energy—Without the Hot Air explains which actions make a significant difference and which make very little. The Economist described the book as “exemplary” and the place to start “for anyone seeking a deeper understanding of the real problems involved”. It can be downloaded free (www.withouthotair.com). You're right. But then it's not *really* just about switching off your mobile phone charger, is it? I've always hoped that if people start turning off their mobile phone chargers, they may also start to think about whether it's really a good idea to leave the motor running while they're picking up the kids from school. Which in turn may get them thinking – perhaps they should have just left the car at home in the first instance? In other words: behaviour change. And once they've started doing "little things", won't they also tell their friends? Might their friends then also change their behaviour? But perhaps I'm wrong. Perhaps this whole switching-off-thing is really just doing something minor while leaving the big issues unattended. I'm hoping for top-down decisions from government, such as: "Big Automotive Industry! You must stop producing gas-guzzling cars. Start making only highly energy-efficient cars. Or better yet, start making bicycles. No whining about potential job losses or the state of the economy – just get on with it." Now why is it I'm not holding my breath for this to happen? I was a little incendiary I'll admit. In the piece I did focus on small inputs that make a tiny difference. There are small inputs that make a large difference: I doubt many people know that a supermarket 'bag for life' is equivalent to 15 miles in a car. For people who drive 10,000 miles a year they can easily find 15 miles. Or more. And It's this difference that's not clear in any comms or news out there – you'll be aware of this as much as I am from your day job (Andrea Krug runs Krug Communications – a specialist PR firm). I'd hate for those people who do make an effort to change their behaviour to find out they were 'moving house one thimble of rice at a time'. Once bitten, twice shy, n all that. We're drowning in a sea of statistics, numbers, and directives. "The National Renewable Energy Laboratory got its hands on six hybrid vans that United Parcel Service is using, and after testing them nine ways from Sunday found diesel-electric technology improved fuel economy more than 28 percent. What’s more, it cost significantly less per mile to operate while delivering the same reliability and performance as conventional diesel vans." 28% is no 'turn left' fudge. Well done UPS. Why we save and not save energy?